It's some time since I was into model boat building the pictures are of a couple of scratch built models I made, the clinker planked steam launch is built from "Vic Smeed" plans, the engine is a single cylinder Trojan steam engine which I made from castings, I also made the boiler. The tug boat was built from "Harold H Underhill" plans, the hull was built from cedar wood using the bread and butter method and about 45" long, superstructure and deck are marine plywood, I made a mould for the life boats and made them in glass fibre, fittings are from the "Web Model Fitting Company" of Wood Green London now long gone I would think, still have their catalogue. 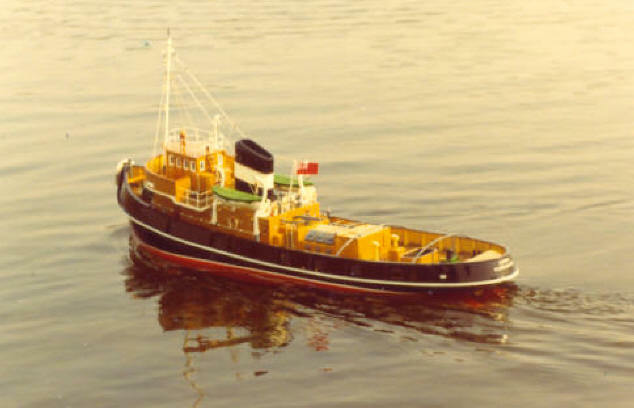 The drawings of the tug were titled Ocean Going Tug, but I found out that the tug boat was the "Wrestler" and was based on the "Clyde Glasgow". The model was fully radio controlled on rudder, speed control, forward and reverse, anchor winch, and the radar scanner was motorised, the propulsion motor was a geared Graupner but can't remember the type, I no longer have the Tug boat, but still have the steam launch. I find your Web site very interesting, takes me back to my model boating days.